You might remember that we posted blondies on here before. These are a slightly more jazzed-up version, with a whole cup of coconut in the dough. They are perfectly chewy and delicious, and topped with a chocolate drizzle and packed with chocolate chips, they are fantastic. 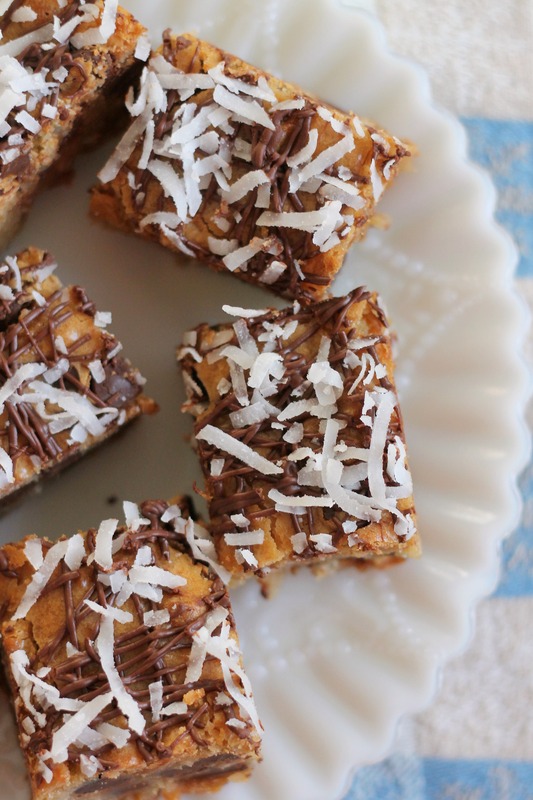 Next time we may try toasting the coconut for the topping…we think that would be delicious! Also, we might stir in some toffee bits as well to heighten the caramel flavor from the brown sugar. P.S. Sorry for the really short post- we have both been quite busy with homework and school activities. But these are good so I guess they don’t need too much explaining! Preheat the oven to 350 degrees F. Grease and flour an 8- by 8-inch square baking dish. In a small bowl, whisk together the flour and salt. In another mixing bowl combine the melted butter and brown sugar and beat until well combined. Scrape down the sides of the bowl, add the egg, and mix until combined. Mix in the vanilla extract until well blended. Add in the dry ingredients and mix just until they have been incorporated into the mixture. Add the shredded coconut and chocolate chunks to the bowl, and fold in with a spatula until evenly distributed. Transfer the batter to the prepared baking dish. Bake for 20-25 minutes, until set in the center but still soft. To make the drizzle, combine the chocolate chunks and butter in a small pan and melt until smooth. Transfer the melted chocolate to a plastic bag with a very tiny piece of the corner cut off and drizzle over the bars. 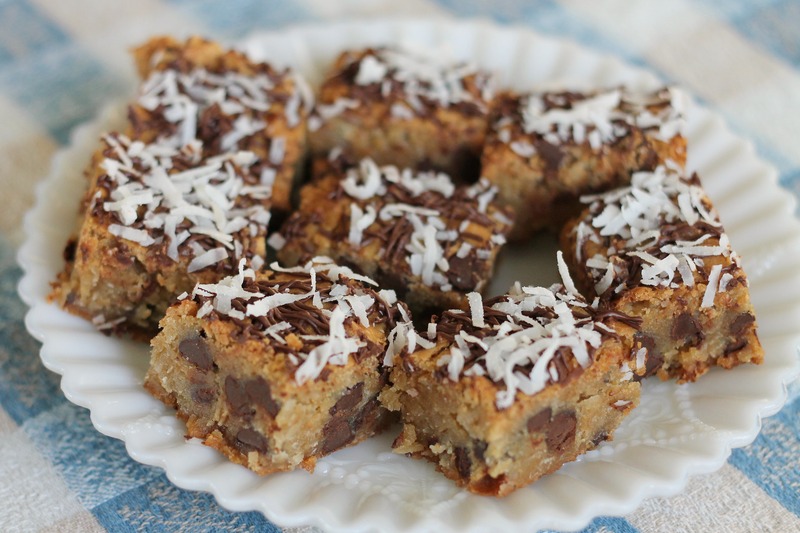 Sprinkle with additional shredded coconut before the chocolate sets (try toasting it and let us know how it is!). Allow to cool completely before cutting into bars. Enjoy!